Tennis elbow, also known as lateral epicondylitis, is a condition where the outer part of the elbow becomes tender due to the inflammation of the elbow tendons.The inflammation causes pain that aggravates when a person conducts activities such as writing, gripping or lifting. 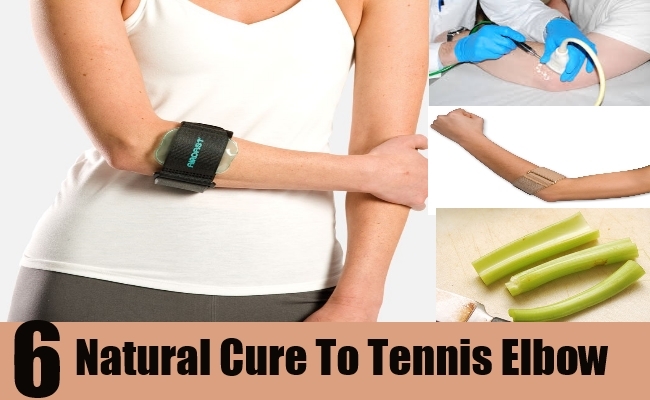 Listed below are some natural cures to get rid of tennis elbow. When you feel pain at the joint of the elbow, take a zipper lock container filled with ice cubes. Wrap a towel or cotton cloth on this container and place it on your elbow. Press and rub the elbow joint gently for about 15 minutes at a stretch.Repeat the process at least three times a day to reduce pain and swelling. You can also rub ice directly on the affected area, but remember to never keep ice pressed for more than two seconds at one place. Use dried herbs in your evening tea and drink at least two cups everyday to relieve yourself of the pain of tennis elbow. Dried herbs like ginger root, white willow bark and licorice have anti inflammatory properties that help to reduce swelling caused by tennis elbow. Add one teaspoon of herbs in one cup of boiling tea and allow to steep for 15 minutes before straining and drinking the liquid. The extracts of turmeric can be concocted into a paste and applied on tennis elbows or added in warm milk for consumption. Turmeric has antiseptic properties that help in relieving pain, reduce swelling and also prevent spread of the inflammation on elbows.Do not consume more than 500 mg turmeric extract a day. But turmeric extracts often induce bleeding and they should not be taken by people who are under blood thinning or aspirin medication. This step is highly recommended for people who are allergic to herbs and children who do not like the taste of herbs. Prepare herbal tea as mentioned above and dip a clean cloth in the hot liquid allowing the liquid to be absorbed.Wring out excess liquid and use the damp cloth as a compress on tennis elbows. Keep the cloth pressed against the elbow until it loses its warmth. Soak cloth in tea again, wring the cloth and reapply on the affected elbow. This process helps to relieve pain and swelling. This green vegetable is not only beneficial in curing the pain associated with tennis elbows, it is also a source of chief nutrients in your daily diet.The juice of celery has anti inflammatory properties and so it cures tennis elbow naturally. You can also apply the juice on the affected elbow region. Many people want to avoid consuming potatoes to avoid the risk of getting fat. But since potatoes are effective in curing tennis elbows, you can use a recently boiled potato and use it as a hot compress on your elbows. The heat and nutrients when absorbed by the skin will heal the broken tendons of the elbows. Consult your nearest doctor if tennis elbow persists for more than a week.